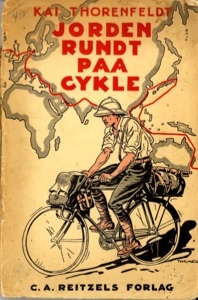 I was most inspired about long distance bicycle touring by the book "Jorden Rundt Paa Cykle" by Kai Thorenfelt who in 1924 set out on a 3 year cycle tour with a single speed second hand Danish bicycle. His book is translated in English "Around the World by Bicycle". I learned that he saw far more and had more intimate contact with people along the route than people traveling in various forms of glass and steel "motorized cages" plus he could do the trip on the resources available to an ordinary Danish worker. A currently built Bicycle similar to the one Thorenfelt rode. As a mid teen I used to ride 100 to 150 miles on day trips. In my late teens I rode part way across England, Norway, Sweden and Denmark where I was impressed by the safe bike paths. I have since cycled across Iowa, Oregon North and South, parts of Idaho, Washington, California, Minnesota, Wisconsin, Maryland and a trip from Copenhagen Denmark to Nordmøre Norway. I have always attempted to make the bicycle a major part of my transport for the good of myself the environment and the safety of others.